It’s hard to know if it’s safe to paint when the weather is so variable, so I’m going through all my supplies again. 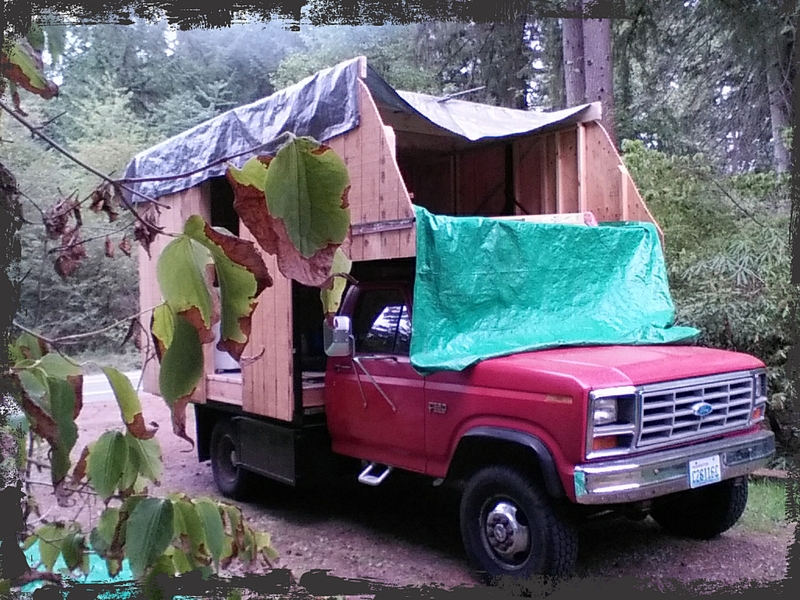 Lately I’ve spent a lot of time on Full-Time RVer sites, which now is close to my future plans. The good ones go into great detail about what supplies and equipment they have found invaluable, and the list isn’t quite the same as a homesteader’s requirements. With that, I will likely make some changes to what I’m going to bring along. Luckily (well, unsurprising, considering how much stuff I have laying around) most of the recommended items are already here…somewhere! I am now going to make an admission that I’ve kept hidden previously: my mother was a hoarder, and I caught a little of that bug myself. Thankfully, I’m a clean person who prefers a clean surrounding. Therefore, all my own stuff is in tidy, but large, piles. My mother wasn’t so much that way, and I’ve spent a huge amount of time going through all her things and cleaning. At least she had a taste for nice things, so I’ve been able to sell much of it to help fund my project. It does get tiring though, and lately I haven’t taken time to organize and sell more things. I’m running out of money again so as the rainy season gets under way, I can add that to my “indoor jobs” list. But, I need the rain to stay away for at least another week or two! Building in the wet doesn’t seem optimal, and I’m not sure it’s even possible to paint in the rain. I’m afraid I’ll find out. 😦 The roof still needs it’s coat of rubber, but that has to wait until all the skylights, windows, and the last of the roof itself is in. The rubber *must* go on in decent weather. Yikes! Total cost of these three items was $3.00. Two of the tubes were donated to my project, and the third I purchased (unopened) from a local ReStore. 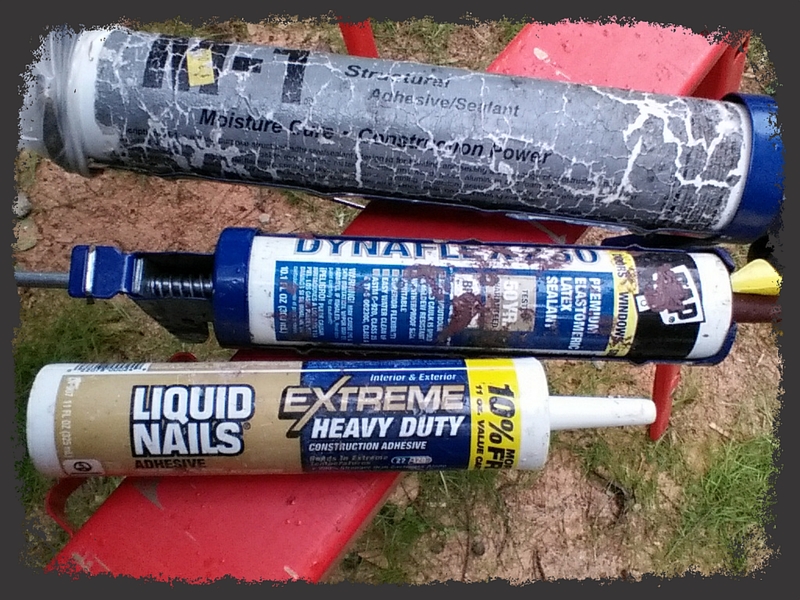 As I tried to place the screws evenly, it was quite easy to find them all, and caulking took all of an hour. So nice to have something go well! Ready to paint now that the screws are caulked and the seams are sealed. If the sky looks at all promising tomorrow, I plan on putting on the first coat of paint. I was unable to find exterior primer, but with 5 gallons at my disposal, I should (hopefully) have enough paint to make several coats so the walls look good. 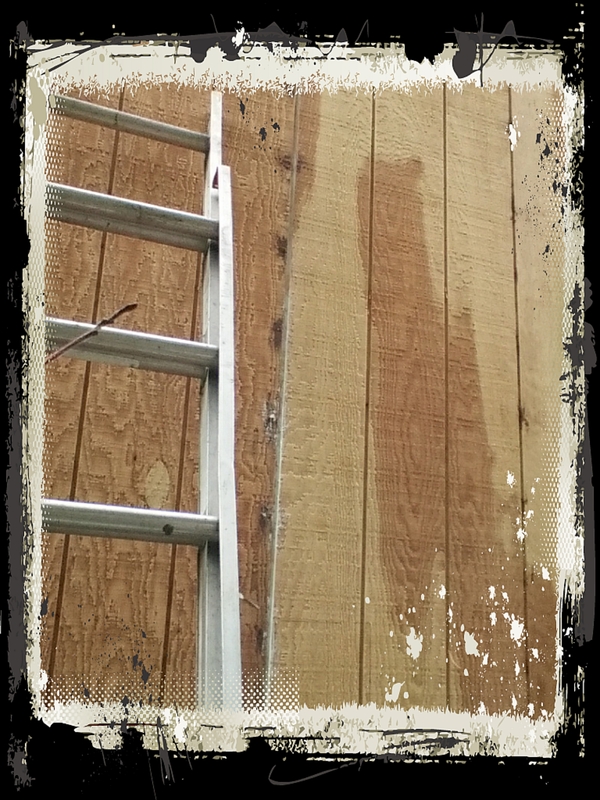 I hope latex paint likes moist weather…. The Beast tarped all over in case of rain. Just little showers so far. Tonight I will start the “fun” project of applying stripper to the windows. Regardless of the claims that it’s safe to use indoors, I’m going to do it in a separate room with the window wide open. I don’t want any fumes to go throughout the house, both for my sake and my furry friends. My latest purchases, made after a marathon 3-days of research, were these: a 2-input monitor, this camera, and this camera. Both cameras are very similar, so I got one of each to compare. I love the options on them! So hoping I am able to manage the installation myself, as otherwise it’ll have to wait until I gather a little more moola. 🙂 So much to do! Hope you are all busy with fun projects too. Also I had hoarders in my family big time. Don’t feel bad about your saving things to use for your project. When you are done you will discard what you don’t need. I once kept windows in my side yard for 20 years against the wall and finally used them in my Secret Garden Art Villa that is on Airbnb. I also put up fountains by the pool that I had for 30 years before ever installing them so it’s okay as long as you have a plan. I am a Designer and know that creative people think differently than the rest of the world. You are living small now and that will serve you well and all those things you don’t need will be sold one day like you said you are selling your Mother’s things and that is a very smart move to give you construction cost capital. You are doing everything right and remember that….go girl. I want to come visit you when I’m in your part of the country. I want to see those beautiful homes up close, and pet all the barn kitties. Sigh, forgot to say that I’m going to use the stripper mostly on one set of windows that has multiple layers of paint that is resisting sanding, and is all lumpy and just awful. I think you are right that mostly I don’t need to worry about removing all the paint.